by Brianna Crandall — September 7, 2018 — US-based LED solutions innovator LEDtronics recently introduced its series of sleek, dimmable light-emitting diode (LED) Mini Wall Packs that reportedly put out a “surprising” amount of light for their compact size and low wattage. These DLC-listed, vertically-configured luminaires replace existing high-intensity discharge (HID) wall packs for wall washing and outdoor security lighting. The WLPV series Mini Wall Packs consume only 25 watts of power, replacing MH and HPS lamps up to 70W — an energy savings of up to 65%, says LEDtronics. The luminaires are compatible with most 0-10V dimmers, meaning not only are they DLC-listed, but also Title 24 compliant. 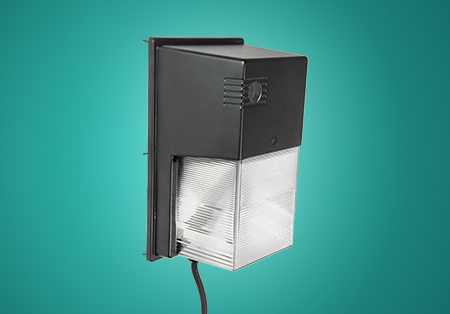 The low wattage and high-lumen mini wall packs provide a controlled, 90-degree-wide directional light that is designed for use in outdoor security lighting, building entrance lighting, warehouses, loading platforms, landscape lighting, walkways, underpasses and pathways, recreation areas, and parking lot lighting, as well as wharf and pier lighting. The new wall packs come in natural white and pure white color temperatures, and run on a wide voltage range of 100 to 277VAC. They are IP65-rated to be moisture-proof, making them suitable for outdoor locations. The solid-state LED technology combined with the impact-resistant, rugged construction means the luminaires are also high-shock and vibration resistant, adds the company. The LEDtronics DLC-listed LED Mini Wall Packs come with an unconditional five-year US factory warranty. They are available through LEDtronics distributors, and quantity discounts are available. Motion detectors and other color temperature options are available for qualified volume orders. For more details and technical data, visit the WLPV LED Mini Wall Pack product web page on the LEDtronics website. For information on how to incorporate the luminaires into your lighting plans, contact LEDtronics. The company says it has been manufacturing in the USA for over three decades, with thousands of customers, including 80 percent of Fortune 500 companies and all the major national and regional US distributors, and is a qualified Government and Defense supplier (CAGE code 8Z410).